Fulvio Rigoni, Salvatore Ferragamo’s new head of design, created a beautiful collection based on the essence of femininity and sportswear. 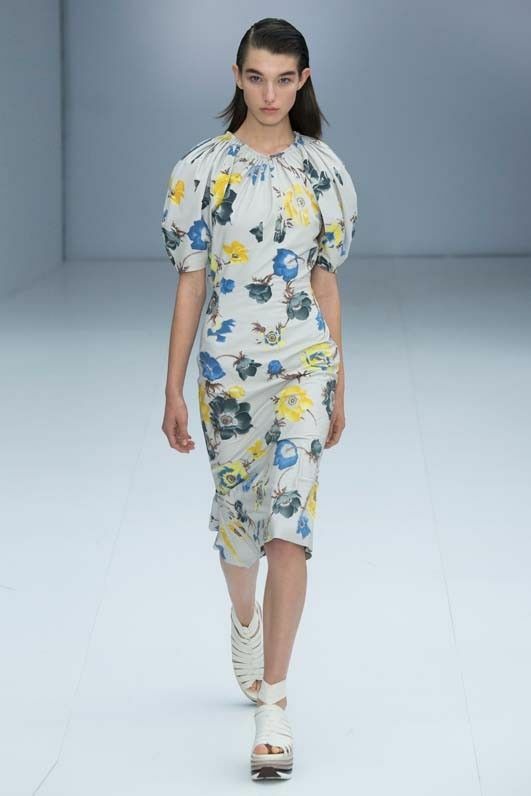 Delicate floral prints were reconstructed with short voluminous sleeves. A palette of electric yellows, reds, and blues complemented elegant tones of navy blue, military green, and white. Accents of perforated leather added a touch of edge to more traditional dresses. Yet the most stellar piece on the runway was the platform sandals. Inspired by the house of Ferragamo’s signature shoes, Rigoni brought back these wedge sandals in crochet and perforated leather textures that flattered both the feminine and sporty elements in the collection. The S/S 17 Ferragamo collection embodied the house’s original style while embracing the coming of a new design era. Keep reading to see our favorite looks from the Salvatore Ferragamo S/S 17 collection, and be sure to shop current pieces here.